You say banana, I say yes. I really love seeing the beauty in everyday things. Just because. The little things in life are often the most beautiful. I cracked this baby open today and I thought it was just so beautiful. I had to share it with you. This papaya was perfectly ripe and delicious. I savoured every bite that I had. I had to share this with my boyfriend though because I wanted to him to share my papaya moment with me. Happiness only real when shared. He had never even tried papaya before and he was really intrigued by the flavour, he thought it was like a sweet avocado because the texture is quite similar. 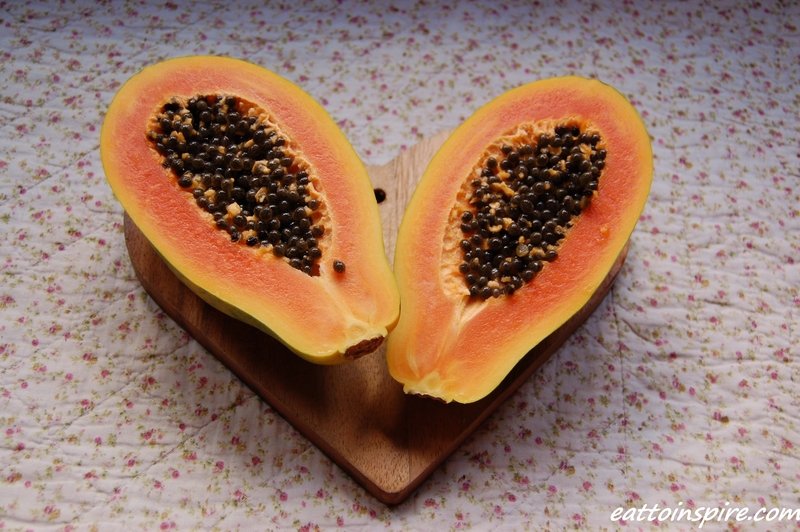 I love the complex flavour of the papaya, it is sweet, fragrant and totally amazing. What fruits have you eaten today? Wow! I LOOOOVE papaya. It’s so expensive here (US) and I remember eating and getting it so cheaply and fresh off the tree where I grew up (Kenya). I took a picture that came out so beautiful last summer of a ‘perfect’ papaya my hubby and I devoured. Don’t think I posted about it. I should have but its nice to see that great minds think alike. It is so true.. the simple stuff is always the most beautiful! Love the photograph, how do you get your web address on it please? Love your enthusiasm, love your openness. I am a fan already.